India is going through a lot of stress these days like Surgical strikes, bans on artists and movies etc. Amidst all the tension and hot-blooded debates, we came across an utterly disgusting Facebook translation. Recently, a facebook user discovered a disturbing Facebook translation while discussing tech bugs on 4chan website. Then we took the matter into our hands to try it out and here is the result. As soon as you click on See Translation, you see a sickening case of Islamophobia which is done by none other than Facebook. 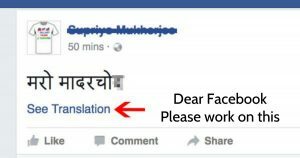 It is one of the most-appalling translation fails we have ever seen on social media. Needless to say, this ‘bug’ needs to be fixed as soon as possible. This is way more than just a problematic error in code. We don’t know why this problem exists but it is truly outrageous.